This dark, dreamy musical is the culmination of Broom Street Theater’s 45th Anniversary season. Three childhood friends, one with extraordinary powers, find themselves trapped in a place where time seems to stand still and the only way out is unthinkable. Traveling on a twisted timeline, Held follows the three as they struggle to grow within the bonds of lifelong friendship and discover what really holds them together. A piano, a cello, and an upright bass accompany the cast through a poetic script and nine hauntingly beautiful original songs. Running time of 75 minutes. 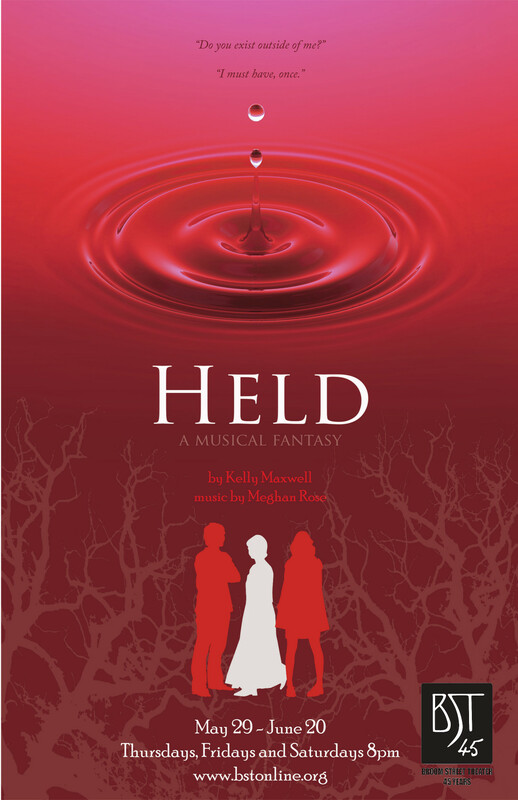 Held is an original musical created by Kelly Maxwell (book and lyrics) and Meghan Rose (music). It is Maxwell’s directorial debut. These two women have been collaborating musically since 2008 with their band Little Red Wolf (Isthmus Favorite New Band 2009, Madison Magazine Alt/Indie Bronze 2015 ) and theatrically since 2014, when Rose was the Musical Director and Maxwell played the lead role in a wildly successful production of Xanadu: the Broadway Musical at the Bartell Theatre (nominated for 19 Bartell Theatre awards, of which Rose won for Best Music Direction and Maxwell for Best Lead Actress in a Musical). Held tells a poignant story of childhood friends growing apart in a world where reality is fluid and time can stand still. Presented in Broom Street Theater’s intimate space, Held promises a powerful evening of original musical theatre.